An Afghan farmer and his son bring in the wheat from their harvest. The number of people in Afghanistan resorting to selling land or turning to friends or family for help because of food insecurity has doubled in the last year, according to a joint report released today by the United Nations and partner agencies. The 2015 Seasonal Food Security Assessment in Afghanistan (SFSA), published by the country's Food Security and Agriculture Cluster (FSAC), found that at the peak of the lean season the number of Afghans facing severe food insecurity increased from 4.7 per cent of the population 12 months ago to 5.9 per cent today. This means more than 1.5 million people are now considered severely food insecure, an increase of more than 317,000. Another 7.3 million people – more than one in every four Afghans – are classed as moderately food insecure. The UN Food and Agriculture Organization (FAO) indicated that the greatest concern in the assessment is the finding that the proportion of severely food insecure people who have already exhausted their capacity to cope with these emergencies has increased, meaning many more are now forced to sell land, take children out of school to work, or depend on relatives for support. The SFSA report shows that the number of people engaged in these ‘last ditch’ actions has doubled over the past year to more than 20 per cent of food insecure people across the country. This will leave even more Afghan people significantly vulnerable to extreme poverty. Meanwhile, the FAO Representative in Afghanistan, Tomio Shichiri, said that although the country will produce slightly more wheat this year, a large number of poor and hungry people will not be able to purchase food from the market. "It is a question of access to food rather than its production,” he explained. “Special attention needs to be given to female-headed households and displaced people to improve their access to, and improvements of, agriculture-based livelihoods." Indeed, the report shows that female-headed households are almost 50 per cent more likely to be severely food insecure than other households in Afghanistan, having a much poorer diet than their peers and a much lower income. Women who head their households are also twice as likely to use emergency coping strategies, such as begging. In addition, people displaced from their homes by conflicts or disasters, particularly those living in tents, also suffer from poor diets. 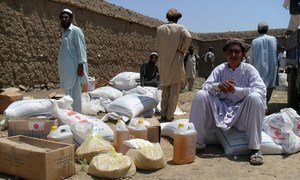 Khost and Paktika provinces, which host over 35,000 displaced households and more than 200,000 people, reportedly need immediate support to prevent food insecurity from worsening. UN agencies, the FSAC and the Afghan Government say that a lack of funding could exacerbate this problem even further. "It is the last resort when farmers start selling productive assets such as livestock, machinery or land," said Abdul Majid, FSAC Coordinator. "This is not only a loss for farmers but for the entire community, as skills and means for agricultural production will be lost, saturating the urban labour market." Meanwhile, the Afghan Minister of Agriculture, Irrigation and Livestock, Assadullah Zamir, said it is striking to know that one third of the population is food insecure and that their situation continues to worsen. “We request the donor community to continue assisting the most vulnerable Afghans before it becomes too late," he stated. The Afghan conflict has intensified in 2015, resulting in record high levels of civilian casualties and new displacements that are stretching the humanitarian community’s ability to sufficiently meet life-saving needs, the United Nations relief wing reported today.